With the arrival of new team member, a host of new projects and Christmas to contend with, the past six months at Archibald Shaw have flown by. Here are a few of our recent highlights. In September we welcomed Pawel Loin, a Graduate Engineer, to the Chichester office. With a recent BEng in Civil Engineering and an MSc in Building and Engineering Structures, Pawel has plenty of fresh ideas to share. He has proven himself to be very adept in 3D modelling and the use of Building Information Modelling (BIM), producing some clever designs for undercroft car parking on a proposed development in Basingstoke. He promises to be a valuable asset to the team. 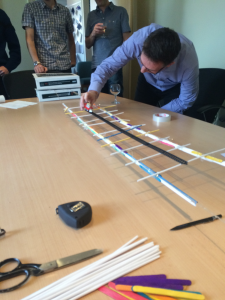 Our traditional end-of-year competition for 2015 was again organised by our Graduate Engineer, Nick Avis. 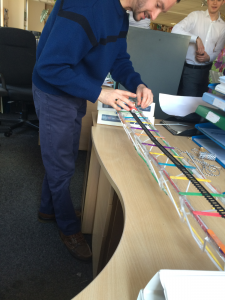 The challenge put to three teams in the Chichester Office was to design and construct the longest bridge capable of supporting a running train. Each team was given the same amount of tape, string and straws and asked to produce the most effective solution within 40 minutes. 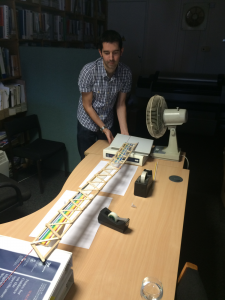 Thankfully the Civil Engineering Team came up trumps with a suspension bridge of a clear span in excess of 1.8m. The New Year started as busy as 2015 finished, leaving Christmas as a distant memory. We are fortunate to have many interesting and varied projects starting including new schools, housing developments, highway improvements, bridges and bespoke structural designs. Find out more about how you could benefit from our services in 2016 by contacting us on 01243 786471 for the Chichester office, or 01635 47369 for the Newbury office. So What’s the Latest at Archibald Shaw?